Personal finance can be intimidating especially if you are a first time investor. But you can now stay on top of your personal finances by following this 5-point checklist. 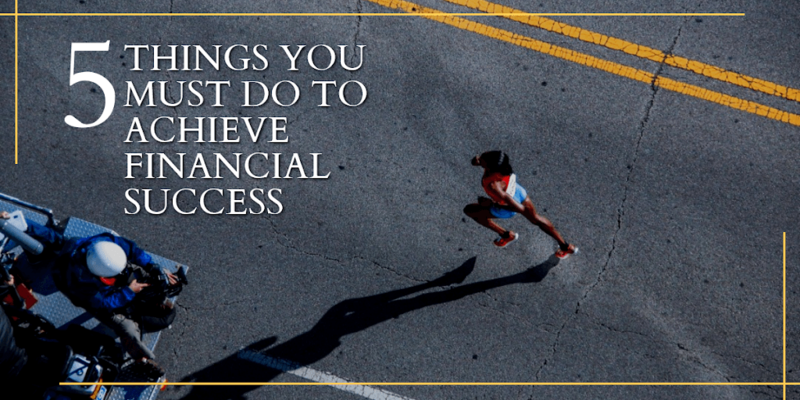 The first step to achieve financial success is to define what exactly financial success means to you. What are the 5 (or even 10, 15, 20) monetary things that you would like to achieve in your lifetime. However, be careful; do not just specify vague goals like “I want to be wealthy”. Go for something specific and measurable like “I want to be a millionaire when I am 40”. The latter are easier to track and achieve. A lot of investors often “just invest” their money in the hope that it will grow enough to meet their future needs. This approach is exactly what it sounds like – shooting arrows in the dark. Instead, investments should be geared toward specific goals. Think of your investment portfolio as a collection of multiple goal portfolios. A goal-based approach to investing is superior because each goal needs a different kind of investment mix based on the nature of the goal and the time available for investment. You need to invest in a safer mix of investments for a “must-achieve” goal such as retirement planning compared to a “nice-to-have” goal like owning an SUV. Similarly, you can hold a more risky mix of investments if your goal is further away since risky investment generally also give higher returns over the long-term even if there are ups and downs in the short-term. Many times we make the mistake of equating risky investments with equities and safe investments with debt. But do you know that you can add a little bit of equities to a predominantly debt portfolio to give a return-kicker without compromising on safety? Or that you can add a little bit of debt to equities to reduce some losses without giving up on overall returns? This happens because different investments such as equities and debt are complementary to each other i.e. they do well at different times in the economic cycle. And hence a correctly constructed mix of different investments can do much better than any single investment. As smart investors, we need to take to take advantage of this fact and hold diversified portfolios. A good thing about the goal-based approach to investing is that it allows you to earmark exactly how much you need to save every month for each goal. Once you take out these savings from your income, you know how much you have left to spend every month. Don’t worry, if this calculation leaves you with a below poverty line spending limit. All that means is that you either need to be more realistic about the goals that you have set for yourself or you need to work on increasing the income side of the equation, (maybe with a side gig). In either case, knowing that your financial life is not on track to meet your goals is the first step towards taking any corrective actions. This point cannot be stressed enough. Professional financial advice can definitely increase your investment returns while leaving you time to do other things. However, all financial advice is not created equal. Unfortunately, the financial advice industry in India is dominated by distributors who provide “free advice” but whose real business is to earn commissions on the financial products that they sell. The problem with this model is immediately clear if we transport it to the health industry for a second. Would you ever consider visiting a “free” doctor who gets paid by the companies whose medicines he/she prescribes? Most people would immediately reach the (correct?) conclusion that such a doctor would prescribe expensive and often unnecessary medicines. The same problems plague financial advice in India. Fortunately, the regulator is taking steps to rectify the situation by separating financial product distribution (which will be commission-based) from financial advice (which will be fee-only). Investors, who think they would like to have professional financial advice, can do themselves a big favour by opting for fee-only advisors who do not have any conflict of interest. This article was first published on IIFL website on April 24, 2017.